Mymensingh: The Birangana Sakhina (B.S.) Silver Pen Awards were distributed to the different fields including journalism; research, science and technology; arts, education, language, literature, and social service at Shahid Shahab Uddin Conference Room of Mymensingh City Corporation on (Saturday) November 10, 2018. The President of the electoral committee Md. Fazar Ali presided over the ceremony. Administrator (Prashasak) of Mymensingh City Corporation and former Mayor of Mymensingh Municipality Md. Ekramul Haque Titu was as a chief guest and inaugurated the ceremony organized by the Electoral Committee for the Birangana Sakhina (B.S.) Silver Pen Award and Creative Association. The ceremony were also held attended by Dr. A.K.M Abdur Rafique, Principal of Shahid Syed Nazrul Islam College, Mymensingh as one of the special guests, Senior Vice President of this electoral committee, Engr.Mohammad Ali Zinnah, former Superintendent (Retd.) of Government Textile Vocational Institute, Founder and General Secretary of the electoral committee Mohammad Raihan Uddin Sarker, Gouripur upazila the New Nation Correspondent, Presenter Md. Sadekul Islam Sadek, Prof. Nazma Mamtaz and with others, elite persons, political leaders, journalists, poets and educationalists, and NGO officials. Senior Vice President of this electoral committee and Returning Officer of the electoral voting systems Engr. Mohammad Ali Zinnah, had announced the result of the electoral vote cast as well as the names of the winners of Birangana Sakhina (B.S.) Silver Pen Awards- 2016 on 2 June 2018. These winners were awarded on (Saturday) November 10, 2018. 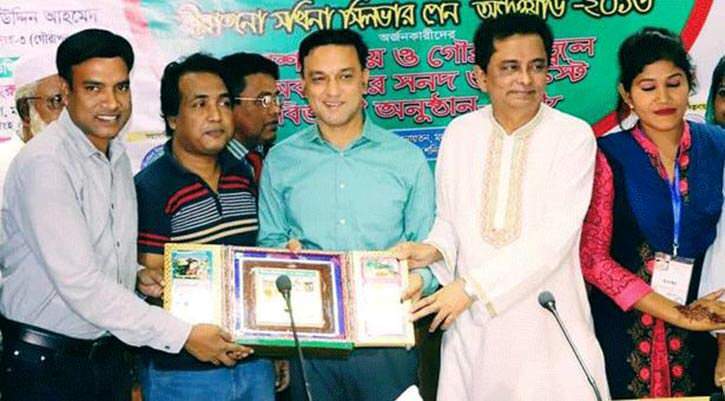 Those who received awards were Haider Jahan Choudhury, freedom fighter, senior correspondent and Vice Prisident of Netrakona District Press Club, Kamran Parvej, correspondent of Daily Prothom Alo, Md. Harun Ur Rashid, Mymensingh Bureaucro Chief of Shomoy TV, Ekram Ud dolah of banglanews24.com and Md. Shafiqul Islam Mintu, Gouripur Upazila correspondent of Daily Ittefaq in the field of journalism, Mithun Kumar Das of Tangail zila as excellent innovator of textile spinning in the field of research, science and technology, Writer and journalist M. A. Latif of Kishoreganj district, Abdur Rashid of Bhaluka upazila, Executive Director of ASPADA, Writer and history researcher Ali Ahmmad Khan Ayob of Porbadhala upazila of Netrakona district, Faruk Ahmed of Tarakanda upazila of Mymensingh district for contribution in the field of arts, education, language, literature, Dr. A.K.M.A Muqtadir, founder of Muqtadir Eye Hospital in Gouripur upazila, Alhaj M.A Wahed of Bhaluka upazila of Mymensingh district, Radha Charon Shaha Roy of Mohanganj upazila of Netrakona district, Engr. Md. Muzaffar Hossain of Jamalpur district, founder of SIM Group for contributions in the field of social service in greater Mymensingh areas .